Is People's Republic of China New Elitist Haven? Redefining communism has fueled China’s emergence but it has also evolved a new hierarchy characterized by wealth and consumerism. The evidence is clear. While many of China’s people particularly the rural live well below the standards of global poverty, some suffering from malnutrition, an elite behaves and consumes beyond mere bourgeoisie styles. They dress not only in Western fashion but Prada and Christian Dior. They consume not only wine over Chinese beer, but it is Chateau Mouton Rothschild. When a Chevy made in China would do, they cling to Mercedes, (including some government officials despite recent directives to do otherwise). According to recent data 70 of the richest of Representatives to China’s National People’s Congress of 3,000 delegates have a net worth of almost $90 billion. This alone is enough to make China’s legislative representatives the richest of any larger economy, from US to India. More telling about the position of old proletariat ideology is that China’s NPC members are appointed by the Communist Party. Elitism might be expected in a society that traditionally demands conformity and defers to authority. Perhaps to degree Confucian ideals and Communist ideology are mutating into something new in today’s China. What is perhaps most troubling though for China and the rest of the globe is to what degree this new structure has become stratified. Mobility is highly restricted, even in official sense. Chinese citizens cannot live anywhere they want, and thus the urban elite is favored in everything from health care to schooling by both quality and permits. The rural poor are exploited on the farm and as cheap labor in urban factories many that resemble turn of the 19th Century sweat shops in the US and Europe. Some claim that the age of conspicuous consumption is going out of style in China, but at least some evidence suggest otherwise including recent sales/auctions of extreme luxury and high-end art. There is indication that some see conspicuous consumption as a means to garner respect of fellow citizens even if resentment may also accompany. Will China’s New Age of Elitism Exploit Nationalism to Justify Itself? So perhaps we are now in China entering the “robber baron” period. Chinese elite and higher-level Communist Party stalwarts compete to control the people and natural resources, labor and production facilities of the globe’s most populous state. It is also probably no coincidence that the robber baron age in the western world brought about more than a flirtation with communism, anarchism. fascism and expansionist nationalism. Is China likely to market its masses an ever more potent nationalism as substitute for equality in opportunity and social-welfare? How will the new elite ultimately justify their wealth/status and demand for respect for their authority? 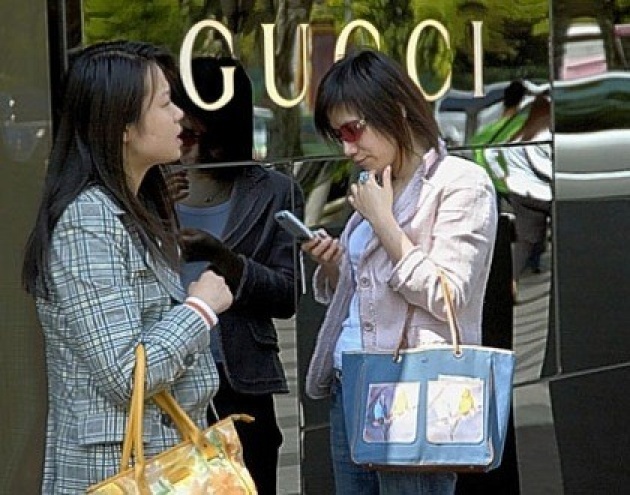 China’s evolving media/social media networks incorporate tight reins on political expression, but it cannot conceal the Gucci Bag and Louis Vuitton shoes that have become the accessory of its legislative body. As China’s contradictions come to greater expression, how will the new elite look to keep the old proletariat in check? Read our Blog for Film - "Unprecedented Scrutiny of China Human Rights"